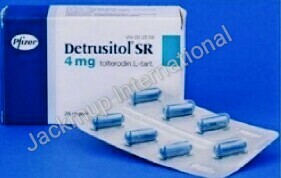 Description:- Detrusitol 4 mg tablet sr is used in the treatment of overactive urinary bladder (sudden urge to urinate and sometime even involuntary leakage of urine). This relaxes the muscles of the urinary bladder and prevents leakage of the urine. It can be taken with or without food, but it is better to take Detrusitol 4 mg tablet sr at a fixed time.